1. Measure the total running feet of refacing needed to be done. 2. Measure the pantry cabinet twice. 3. Add the total amount of crown moulding and light rail if needed. 4. Add the total number of drawer boxes to be replaced. 5. Add the number of modifications, for example a fridge height increase or a microwave cabinet above stove would be considered one modification. 6. For counter top, measure each section separately along the backside and round up to the nearest foot. (Based on a standard depth of 25-1/4“) Consider if any electrical, plumbing, tile work or floor replacement is needed. We can schedule certified trades to have your project completed at the proper time. Example..30 feet of cabinets needed to reface, Customer request 20 feet of crown, shorten stove cabinet for new above stove microwave, Add 4 roll outs in pantry for this small kitchen storage ideas, Cut down fridge height for a taller fridge, add one double garbage can. 25 running feet Supply and install new mid range counter top. 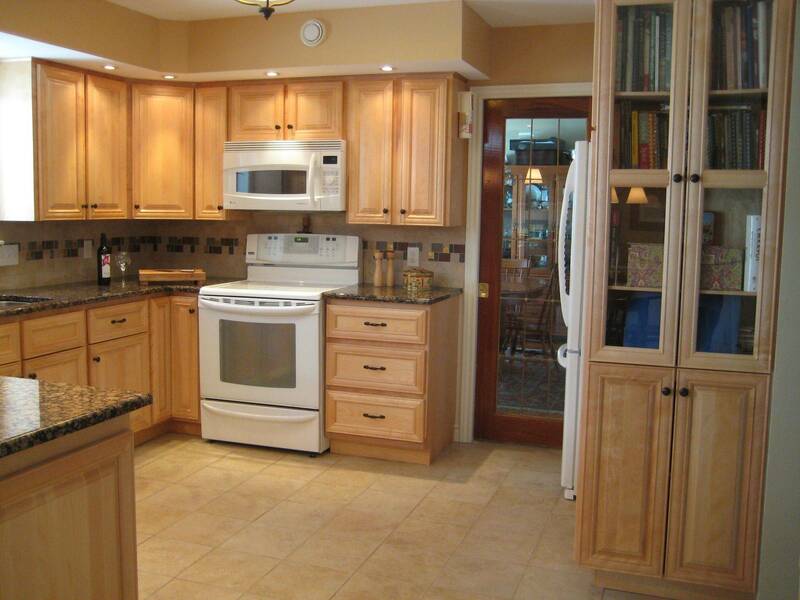 Kitchen Cabinet Refinishing and Renovation Cost can be off set by a few different options. What is listed is only an estimate. With my customers we offer DIY cabinet refinishing keeping your cost down. What we do is clean,lightly sand doors. Then re-stain to existing colour. Based on 20 doors and 5 drawer fronts. Re-stain any areas where there are blemishes or fading on existing door and cabinets. Average cost is $1000.00- $1500.00 plus tax. Go to our cabinet refinishing door program. Based on 20 doors and 5 drawer fronts. You paint the cabinet boxes and sides and replace the kitchen cabinet doors. I do offer the proper information for paint and colour preparation. Additional Savings by you doing some of the work. 1. Removal of the old cabinet fronts. 2. Removal of trim and moulding. 3. Removal of the countertop. 4. Disconnect the sink and plumbing. stain application is $3900-$4900 starting Price. 22 feet of a mid range laminate countertop.. $550-$750 Extra charge on top of Base Price. *Base price* is the starting price. Overall if you are covering all cabinet fronts and end panels you could save up to 60%-70% if you are a DIY person. 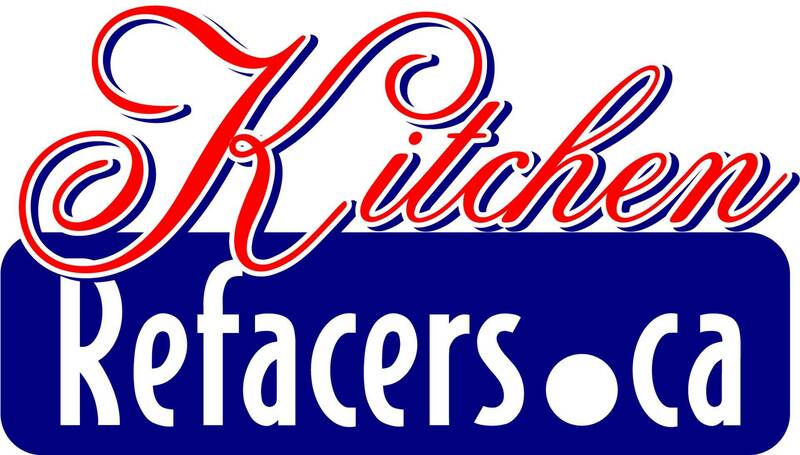 optional drawer box replacement, hardware,removing and installing some new cabinets will increase your kitchen refacing cost. Also you are saving in kitchen downtime compared to new kitchen replacement . 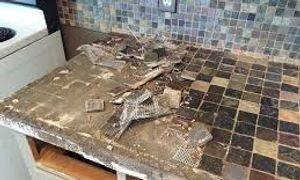 We leave your sink,stove and fridge in place till we are ready to replace your counter top. So you can use your kitchen every evening. 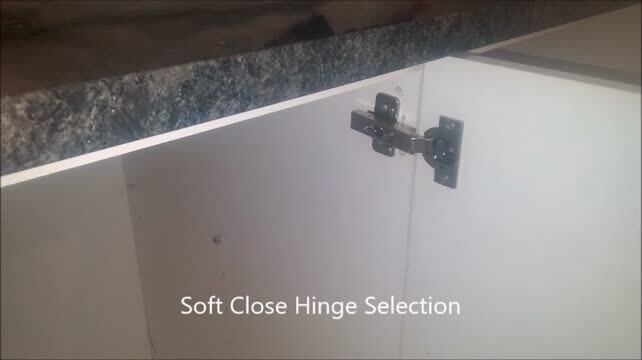 One main advantage replacing your cabinet doors is that you can change the style and switch your hinge system to a soft close if you have not already click this cupboard door replacement for more information. Customers will ask me they like to have a white or Grey finish. Once they learn that there are six shades of white and grey. The price can increase by $200.00 to $300.00 on an average job. Some wood grain finishes fall into the same price point as other whites, greys and cream colours. The one difference in some finishes is the surface texture. Looking at the surface closer you can see how one can have a rough texture compared to another being smooth or satin. Another price increase can result in different crown moulding sizes and colours. A crown moulding with a lot of detail can result in a higher price point. Keep in mind, some jobs require more material which again can increase per linear cost to supply and install. Hardware upgrades such as soft close drawer tracks, handles and hinges can increase cost by $100.00 to $1000.00 this is only an estimate. Remember always ask Questions. Paying for upgrades that you use every day is well worth the cost. That being your hinges. Another cost increase can result in your counter top selection. We will continue with this topic in an up coming page. When selecting countertops, your first choice would laminate for affordability. It comes in a wide variety of colors and styles, many of which are created to look like granite, marble or other high-end materials. Many customer are surprised to see the variety of colours and textures that look like marble and granite. Keep in mind, it is best to see the whole laminate counter top then one small sample piece because of colour variation. The old laminate top or tile top is constructed on a plywood surface then nailed down to the top of the cabinets. This will result in a higher price point for removal. If you are handy and have a few hours to spare try it yourself. These are a few points to consider and pricing does vary across the country. Laminate countertop cost: $18-$45.00 per running foot. Supply only, not installed. 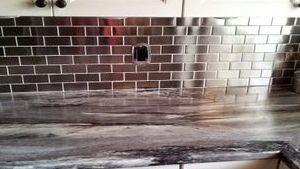 Countertop installation cost is determined by the running foot price along with the number of finished ends or (Caps) mitre cuts, removal of the old counter top. haul away of the old top and plumbing.